"Drawing on plant imagery from popular and classical references, Morrison's breathtaking compositions produced by eliminating color, leave the viewer to project their own associated vision onto the canvas, utilizing 'color from behind the eye'. 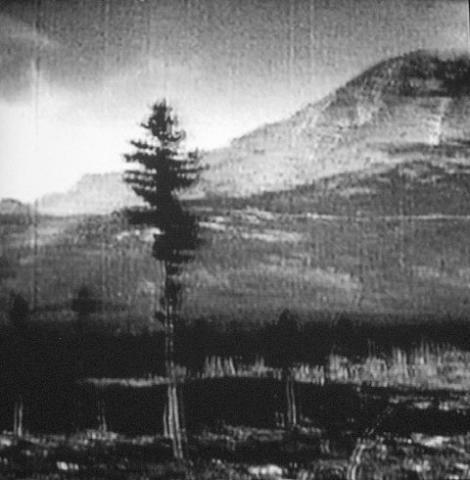 Morrison's films combine heavily modified footage from a number of different sources that are manipulated to introduce a new focus on light and shadow." - Enrique Juncosa, Director, Irish Museum of Modern Art, 2003. Cheim & Read is pleased to announce the first New York solo exhibition of British artist Paul Morrison, who has gained wide international recognition for his bold graphic-style black and white landscape paintings, site-specific wall paintings and films. The exhibition will feature a new DVD projection in the front gallery, a 360-degree wall installation in the main gallery and new works on canvas and aluminum in the rear gallery. Up to now, Morrison's imagery has fused cartoon, scientific and art historical material ranging from botanical illustrations and Disneyesque flowers to Dürer inspired trees and foliage. In the new works at Cheim & Read, Morrison continues to explore the boundaries of landscape with an explosion of new imagery including Colt's-Foot flowers, Monkey Puzzle trees, Buttercups, Thistles and an archaic lakeside house. Paul Morrison was born in Liverpool, England in 1966 and studied at Goldsmiths College, London. He has exhibited widely in US museums including Aspen Art Museum, Colorado; The Carpenter Center for the Visual Arts, Massachusetts; Birmingham Museum of Art, Alabama; UCLA Hammer Museum, Los Angeles and The Drawing Center, New York. In Europe, recent museum solo shows include the Irish Museum of Modern Art, Dublin; the Galleria d'Arte Moderna e Contemporanea, Bergamo; Magasin, Grenoble; Southampton City Art Gallery and Kunsthalle Nürnberg. Forthcoming museum group shows include the Tel Aviv Museum, Israel and Tate Britain, London (2004). "Black Dahlias", a portfolio of 12 screen prints by Paul Morrison published by Paragon Press was recently exhibited at the Armory Show, New York.